Yesterday, I had a phone call with a watch dealer that I know for quite some time. It was quite a while since our last conversation, so we had a lot to talk about. He told me that he bought this IWC Big Pilot Perpetual Calendar, in stainless steel. I didn’t know about this version, only about the platinum version (click here to read about the platinum version). 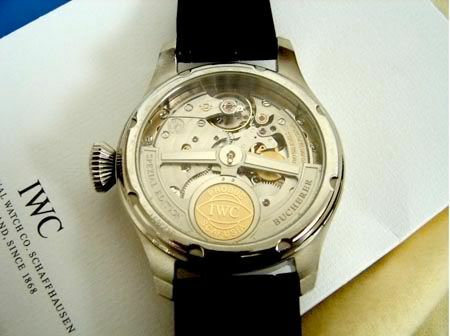 It seems that IWC made them as a ‘Bucherer’ special edition. Bucherer was founded in 1888 by Carl-Friedrich Bucherer, who opened his first watch and jewelry store in Lucerne, Switzerland. Nowadays, there are 18 shops in Switzerland, Germany and Austria. I was in their store in Lucerne a few years back, they have a pretty impressive collection of watches. 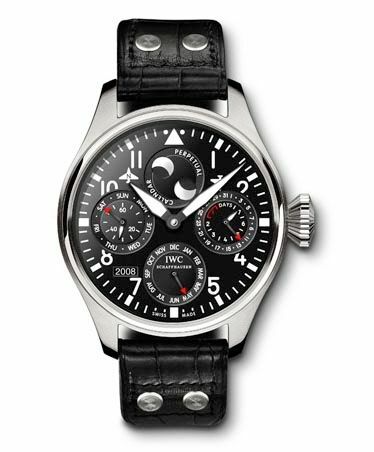 Anyway, they seem to have this IWC Big Pilot Perpetuel Calendar, exclusively made for Bucherer in 2008. In total, a 100 pieces were made of this watch, 70 pieces (ref. IW502607) in stainless steel and 30 (IW502608) in red gold. This 46mm wrist watch is probably not for everyone, since its price was approx 22.000 Euro (list), and 32.000 Euro for the gold version. Currently, there is a stainless steel model for sale at EuroWatches (via Chrono24) for 26.000 Euro. Despite of the credit crunch, there is still demand for collectors pieces in this segment. Pictures from http://www.fliegeruhr.ch and consider this site to be a great source of information on pilot’s watches anyway! If you are interested in IWC anyway, check my last post on IWC and its 2009 novelties presented at Ace Jewelers on the 6th of April.